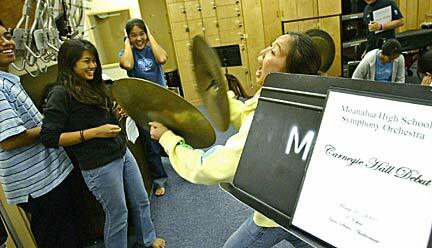 Members of the Moanalua High School Symphony Orchestra, from left, Maurice Tokuda, Noelle Panagasagan, Corisa Kawasaki, and Holly-Jill Mau, had some fun with cymbals yesterday before packing for their upcoming performance at Carnegie Hall in New York. » The Moanalua High School Symphony Orchestra last played Carnegie Hall in 1998. A Page A3 article yesterday incorrectly reported that it was in 1988. Moanalua High School students will play Carnegie Hall among some tough company, says music director Elden Seta. "But the kids will be very ready. They are gonna do Hawaii very proud. It's a huge honor, but we will more than rise to the occasion," Seta said. They will perform Sunday in Carnegie's annual Ensemble Debut Series, which includes the semi-pro New York Symphonic Ensemble and the Greater Miami Youth Symphony, Seta said. It's an encore performance for the Moanalua High School Symphony Orchestra, which leaves for New York tonight. It will take three flights to get the 100-plus member group and their parents and supporters there in time for the concert. Marty Borja, an 11th-grader and trumpet player for Moanalua's orchestra, loaded a French horn into a specially made case yesterday, while Allison Kunichika readied more instruments behind him. Moanalua was the first high school orchestra ever to be invited to perform at Carnegie Hall in 1988, and represented the United States at the 2004 International Band Festival in Japan. Yesterday afternoon, it took several "crazy" hours to finish packing the instruments in about 40 specially made crates built by an eight-student crew and several adults, Seta said. Special padding and braces inside the crates had to be created, a "pretty complicated process," but necessary to prevent any possible movement of the instruments that could result in damage, he said. Their cargo includes instruments like three tubas, seven gigantic basses, a gong, formal tuxedos for the guys and gowns for the girls. Three seniors who will perform solos at Carnegie Hall said they were nervous of being on a world-class stage. "It will be very intimidating standing there in such a famous, renowned hall," Park said. Jomel Sumiya, who plays the violin, will also be singing "Honolulu City Lights." After preparing for months, it seemed the concert was so far away, but now the time has finally arrived, she said, adding, "I can't believe we're playing at Carnegie Hall this Sunday!" Sumiya said she wants to "use music as an additional medicine for the soul" when she becomes a pediatrician and performs for patients confined at a hospital. Jill Morita, a cellist, said she has been practicing hard and putting in extra hours on her own going over difficult parts of the music. "The program is very demanding -- all the pieces (four) we're playing are so different. It takes a lot of emotion. It's like a roller-coaster ride; it is emotionally exhausting," Morita said.